You can observe the seat selection process beginning 30 minutes before your scheduled appointment time. You will not be able to select seats for your account until your selection date and time. Once you have added seats to your shopping cart, you will have a total of 30 minutes to complete your session. If you do not click "Approve Selection" after 30 minutes, any seats being held on your account will be released and you will need to start the process over from the beginning. Change/select your seats for the season by logging in on or after the day and time you were allocated. This site may be used to view available seating in real time. Seating inventory is continually updated allowing you to view seats as they become available. Seat relocation is a one-time opportunity. Once you submit your seat selection and confirm the seats you wish to release, your former seats will be released into open inventory for other fans. The relocation appointment time is based on your season ticket plan type and account tenure. 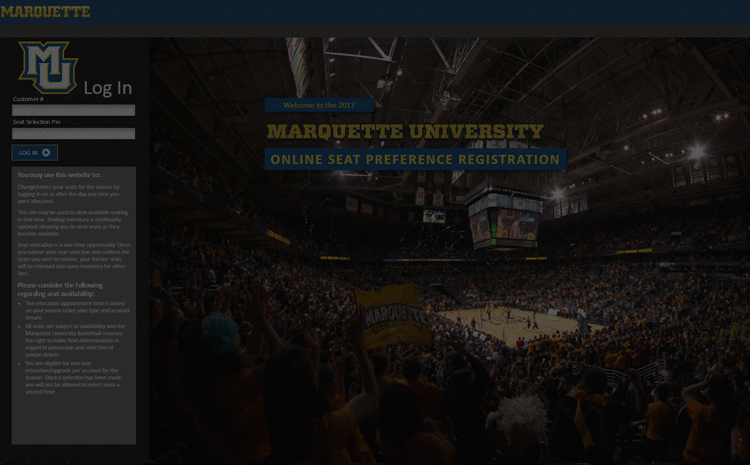 All seats are subject to availability and the Marquette University Basketball reserves the right to make final determination in regard to possession and selection of season tickets. You are eligible for one seat relocation/upgrade per account for the season. Once a selection has been made you will not be allowed to select seats a second time. Any packages that are dropped are immediately available to others and are not able to be recovered.